Taste test: I'm a little confused here. 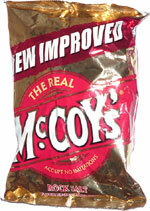 I've previously eaten several flavors of McCoy's chips, and they're always thick and rippled and just about always have bold, strong flavors. I didn't know exactly what "Rock Salt" was supposed to mean in relation to chip flavors when I was given these, but I figured that, at a minimum, they were going to have a lot of salt on them. To my great surprise, they have very little salt. 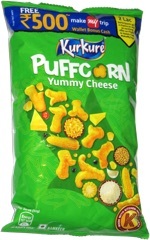 They're basically plain ripple chips, so you taste mostly the potato. They're good, with the thickness and crunchiness I've come to expect from McCoy's, but the lack of salt was kind of a letdown.